Statistics Canada is a member of the Industry portfolio. Statistics Canada's role is to ensure that Canadians have access to a trusted source of statistics on Canada that meets their highest priority needs. The Agency's mandate derives primarily from the Statistics Act. The Act requires that the Agency collects, compiles, analyzes and publishes statistical information on the economic, social, and general conditions of the country and its people. It also requires that Statistics Canada conduct the census of population and the census of agriculture every fifth year, and protects the confidentiality of the information with which it is entrusted. Statistics Canada also has a mandate to co-ordinate and lead the national statistical system. The Agency is considered a leader, among statistical agencies around the world, in co-ordinating statistical activities to reduce duplication and reporting burden. More information on Statistics Canada's mandate, roles, responsibilities and programs can be found in the 2015–2016 Main Estimates and in the Statistics Canada 2015–2016 Report on Plans and Priorities. Statistics Canada has the authority to collect and spend revenue from other government departments and agencies, as well as from external clients, for statistical services and products. This quarterly report has been prepared by management using an expenditure basis of accounting. The accompanying Statement of Authorities includes the Agency's spending authorities granted by Parliament and those used by the Agency consistent with the Main Estimates for the 2015–2016 fiscal year. This quarterly report has been prepared using a special purpose financial reporting framework designed to meet financial information needs with respect to the use of spending authorities. The Agency uses the full accrual method of accounting to prepare and present its annual departmental financial statements that are part of the departmental performance reporting process. However, the spending authorities voted by Parliament remain on an expenditure basis. This section highlights the significant items that contributed to the net increase in resources available for the year, as well as actual expenditures for the quarter ended June 30. Chart 1 outlines the gross budgetary authorities, which represent the resources available for use for the year as of June 30.
decrease for the 2011 Census of Population Program ($2.8 million), as the program is complete. In addition to the appropriations allocated to the Agency through the Main Estimates, Statistics Canada also has vote net authority within Vote 105, which entitles the Agency to spend revenues collected from other government departments, agencies, and external clients to provide statistical services. 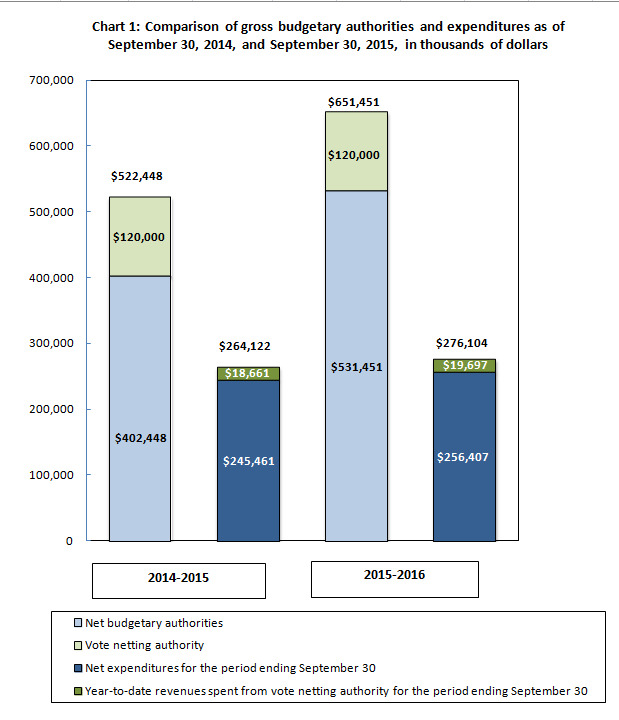 Vote netting authority is stable at $120 million in each of the fiscal years 2014–2015 and 2015–2016. Statistics Canada spent approximately 24% of its authorities by the end of the first quarter, compared with 32% in the same quarter of 2014–2015. This table displays the variance of departmental expenditures by standard object between fiscal year 2014-2015 and 2015-2016. The variance is calculated for year to date expenditures as at the end of the first quarter. The row headers provide information by standard object. The column headers provide information in thousands of dollars and percentage variance for the year to date variation. Note: Explanations are provided for variances of more than $1 million. 01) Personnel: The increase was mainly the result of the arbitration award for interviewers and increased collection activities related to cost recovery projects. 03) Information: The increase was the result of the coding review of the standard object definitions and inclusions (e.g., data purchases). 09) Acquisition of machinery and equipment: The increase was the result of timing differences between years for the acquisition of computer equipment. 12) Other subsidies and payments: The decrease is a result of the one-time transition payment for implementing salary payment in arrears made in the first quarter of 2014–2015 by the Government of Canada. Revenues: The decrease is primarily the result of timing differences between years for the receipt of funds related to the census cost-sharing agreement with another government department. continued realignment and reprioritization of work. In addition, Statistics Canada uses risk management and a risk-based decision-making process to prioritize and conduct its business. In order to effectively do so the Agency identifies its key risks and develops corresponding mitigation strategies in its Corporate Risk Profile. There have been no significant changes in relation to operations, personnel and programs over the last quarter. For the coming quarters, there will be notable changes in the operations due to increased activities related to the 2016 Census of Population Program. This table displays the departmental expenditures by standard object for the fiscal year 2015-2016. The row headers provide information by standard object for expenditures and revenues. The column headers provide information in thousands of dollars for planned expenditures for the year ending March 31; expended during the quarter ended June 30; and year to date used at quarter-end 2015-2016. This table displays the departmental expenditures by standard object for the fiscal year 2014-2015. The row headers provide information by standard object for expenditures and revenues. The column headers provide information in thousands of dollars for planned expenditures for the year ending March 31; expended during the quarter ended June 30; and year to date used at quarter-end 2014-2015. This table displays the departmental authorities for the fiscal year 2015-2016. The row headers provide information by type of authority, Vote 105 – Net operating expenditures, Statutory authority and Total Budgetary authorities. The column headers provide information in thousands of dollars for Total available for use for the year ending March 31; used during the quarter ended June 30; and year to date used at quarter-end for 2015-2016.